This continues my series on git, because I think it’s good to know what the command line is and how to use it. Once you have git running, the thing I’ve often wanted to do is go get code from somewhere. Certainly the creation of a repo and new code is something you might do, but often you’ll be looking to get code from somewhere else, so let’s look at how we can do this. Off to the right is a “clone” button, which is what we want to do. We want to perform a git clone. If you click the button, a URL is in an edit box. 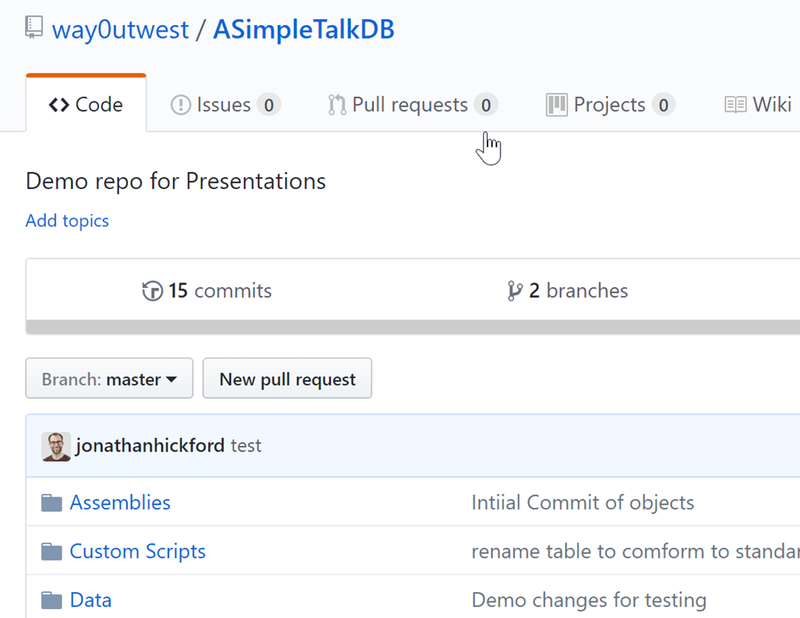 The URL is: https://github.com/way0utwest/ASimpleTalkDB, the same as the repo above. Let’s clone this. 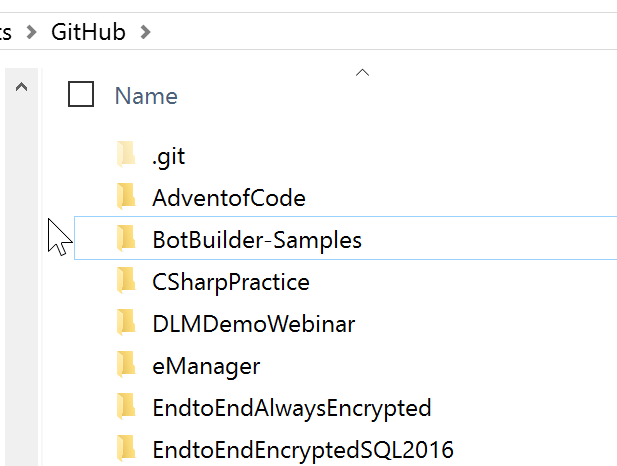 First, get a folder to store code in. I started with a Documents\Github folder on my various machines. I’ll use that, and as you can see, this is a place I have a number of folders, each one a repo. I don’t have this repo set up yet. By default, the name of the repo becomes a folder name, with all the code below that. If I look in Explorer, I can see this. However, I can control this. I’ll delete the folder and do this again. That’s the power of a VCS. I don’t need to worry about this code, because I’ll go get it from another repo. 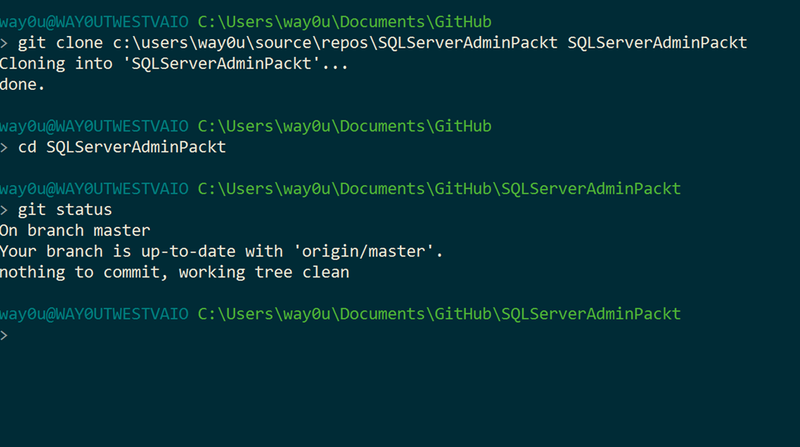 Once I delete the folder, I’ll re-run the git clone command, but with the name of a folder added to the end. 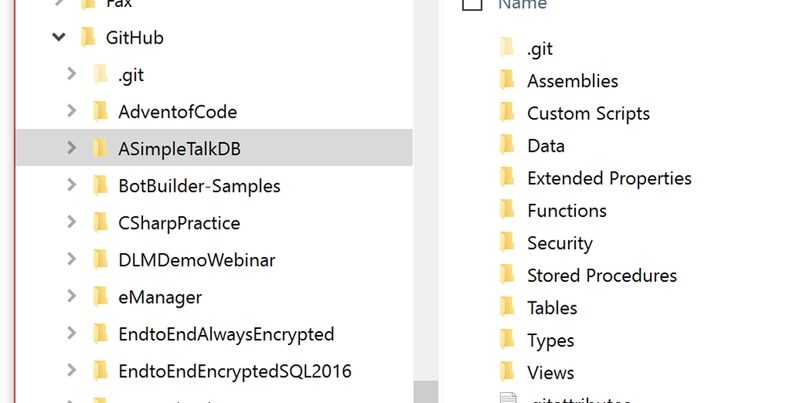 What if I have code inside the company, and not in Github, Gitlab, BitBucket, VSTS, etc. Can I clone things? Yep, you can, but don’t use this to get a copy of your own code. That’s what branches are for. We’ll talk branches later, but for now, we can assume you might have a repo in your company. Again, this isn’t the way to get a copy of my own code to work on. This is for getting a repo that I want to work on for myself, where I’ll then merge changes back to the original repo on another machine. On my own machine, I’d just use branches. This will help you get some code, and I’d encourage you to copy some code down and see how it works. Go get some code from my repo and build a db if you have SQL Source Control (point this to your cloned repo), or grab something from Microsoft and play. That’s it for this post. There are lots of places to go. I’ll talk about how to now push your code elsewhere once you’ve changed it in another post as well as how to branch and accomplish a few other things. This entry was posted in Blog and tagged DevOps, Git, SQLNewBlogger, syndicated. Bookmark the permalink.